Francis Chappell & Sons have been at the heart of the London community for over 175 years. 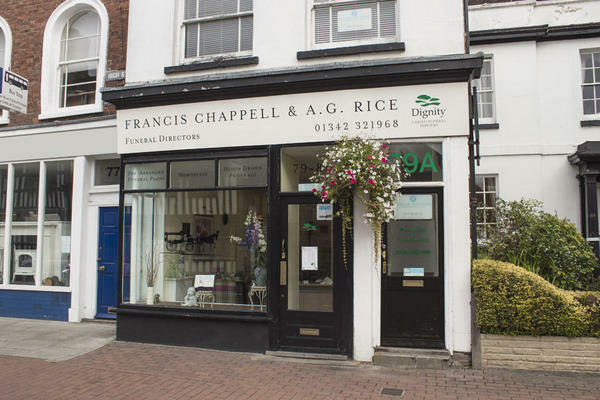 Our Francis Chappell & A G Rice funeral home is in East Grinstead, one of Chappell's 25 funeral homes in south east England. We continually strive to set the bar in standards for funeral services, care and facilities, because we understand how important it is to get things right when it comes to saying farewell. We still carry the same values of our founders from the 19th century; uncompromising compassion, quality and professionalism are at the heart of all we do. Our funeral home has a beautiful frontage and comforting interior to help you feel more at ease when you visit us. Our team will listen to your thoughts and wishes with the utmost care, guiding you wherever you feel you need it. We are proud to work with some of the longest serving, hardest working and most dedicated funeral professionals in Greater London and West Sussex, some of whom worked with the Chappell family themselves. We are always here to help you, 24 hours a day. Please call us as soon as you need any advice or assistance. Call us today on 01342 321968 to talk through your personal requirements. At Francis Chappell & A G Rice Funeral Directors, we understand how special life is with those that you love. For us, every funeral is unique and personal. We have a service to fulfil every wish, with every detail carried out with the same uncompromising quality of care. From a traditional service, to a colourful woodland burial, your options are limitless with our Full Service Funeral. If you have a little more flexibility when it comes to arrangements, then we can provide a Simple Funeral for a lower cost. We have a space on our driveway which may be reserved if you call in advance. There is also on street parking available. We are the last shop on the High Street, next to Sackville College. Our staff are available 24 hours a day on 01342 321968 if you require our services outside of these hours.